Allow us to stray away from the norm and give you the bad news first. Michael Muthua��s latest play could very well be his last one for some time to come. The founder of Boardwalkers, whoa��s been staging (and acting in) plays for the last 25 years, wants to take time off and direct a full length feature film. a�?Ia��ve been wanting to do movies all my life, so I think ita��s time I just went ahead and did it. I already have three scripts ready to go; I just havena��t had time to go meet producers,a�? begins Muthu, who wants to start with a dark tale set in the 1800s and tell us nothing more that it is a�?a true but unknown wild wild west-like Indian story with lots of action and intriguea�?. And now on to the good news. 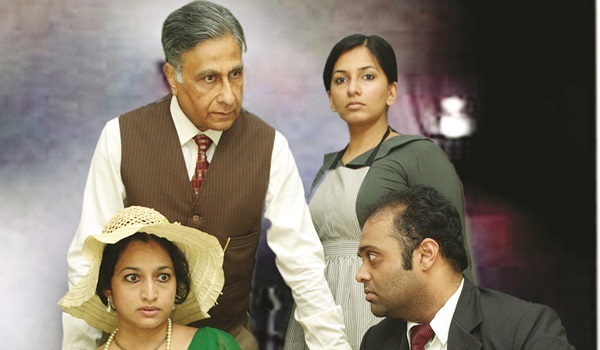 The director is almost ready with his suspense thriller, Gaslight, a co-production with The Madras Players. a�?Ita��s been a while since I tackled this genre and this onea��s been on my bucket list,a�? says Muthu, a fan of both the play and its 1944 celluloid adaptation, adding, a�?I only choose a script if it engages me enough to read it in one sitting. If it takes longer, I dona��t even consider it for production.a�? Penned by British playwright Patrick Hamilton in 1938, Gaslight follows the story of a couple living in Victorian England. The husband, who has a secret, does his best to convince the wife that she is slowly going insane. But the intervention of a policeman puts a spanner in the works. a�?One of the reasons I teamed up with The Madras Players is because I wanted a senior actor to play Detective Rough and I knew PC Ramakrishna fit the role. For the other two lead roles, I had the actors in mind (Sarvesh Sreedhar and Shaan Katari Libby) and, thankfully, they agreed to do it,a�? he says. The only challenge he faced while directing his a�?swan songa�� was getting the period right. Muthu researcheda��both in the pages of books and onlinea��to nail the Victorian architecture, dA�cor and costumes. And he promises us a slice of the times through the sets that he is building and the costumes being created by his wife. a�?Ia��ve also made sure Ia��ve removed all references to the place and deletedA� overtly British references, so that the play is neutral,a�? he explains. With the last spurt of rehearsals underway, Muthua��who acted in Manoj Night Shyamalana��s debut film, Praying With Angera��might miss the a�?boardsa�� he named his theatre group after, but at the end of the day he feels both plays and movies are the same, telling stories.